In just two weeks, we’ll be flooding into the casinos of Las Vegas for DEF CON. By far our favorite part is the unofficial hardware badges which make their way to the con each year. The AND!XOR team has put together an incredible offering this year with what I’m calling the “Bender on a Bender” badge. They sent us two of them, so let’s jump right in and see what this badge is all about. As with last year, the aesthetic is simply spectacular. I know this is a funny thing to say, but the PCB itself just looks like higher fabrication quality than most. The black solder mask is a perfect matte finish, the strategic use of exposed gold-plated copper layer and matte white silk-screen accentuates that, and the components are obviously placed with loving care to produce an eye-candy result. This isn’t the team’s first rodeo. They built their original Bender-themed badge last year — check out my hands-on review if you missed it — selling 175 in mere minutes, but were around with a non-Futurama design in 2015 too. This year’s fix was to go through Kickstarter for presales and more than quadrupling their funding goal. Backers are already receiving their badges and showing off their work on the team’s Twitter channel. So what’s under the hood? Well, there isn’t a hood, it’s a PCB badge. The crazy thing is that this badge is really an add-on for a wireless SoC module. The Rigado BMD-300 hanging out on the tip of Bender’s hat drives everything. It includes a Nordic ARM Cortex M4F, and to my dismay, does away with the spring antenna which made last year’s badge so unique. Another upgrade this year is the display. The badge has moved away from monochrome OLED and replaced it with a color LCD. This screen looks great, in fact, when I was first playing around with it I thought it might be a color OLED (but of course price would make that all but impossible). 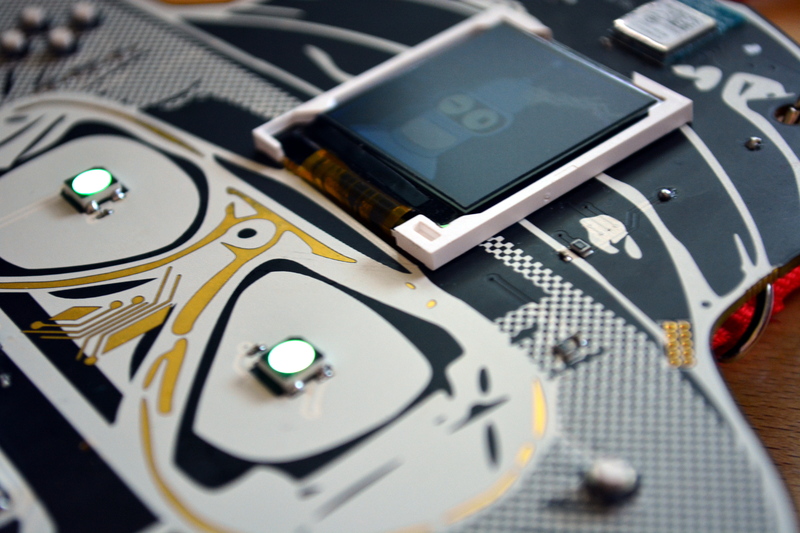 The display, paired with RGB LED modules and five buttons (d-pad and one action button) make up the user interface. The interactions are where things start to get really crazy. Check out the video below for a walk-through of what the firmware has going on. It’s incredibly impressive. Obviously, there are visualizations and an SD card on the back of the board blows away the storage space limitations normally faced by on-chip Flash. There are a couple of simple games you can play, but the team did something brilliant to expand the capability of this badge: port the Chip-8 interpreter over to Bender. It lets them load in dozens of proven games without blowing up their own development time. Now, you can write your own games/demos/programs and just drop them on the card for the interpreter to run. This is nice, but the killer features on this badge will surely be wireless interaction. A Bluetooth mesh network will come into being when the badges are all in the same vicinity. I got a taste of this when I had one badge running and was filming the second (as if it was my first time unboxing it). At startup, one badge found the other and alerted me with “Welcome Nixon” — Nixon being the name of the other badge. There is a “nearby” menu item that will tell you the name of each badge along with a signal strength reading. The rest of the features are hidden, as the badges shipped out requiring an activation code that will only be available once the con begins. But the instructions card above gives a pretty clear outline of what is to come. A custom app will let you terminal into the badge. From there it’s all about defending your kingdom while trying to take over that of others. Mix in some god mode features from the developers’ badges and you have a recipe for fun. All and all, the product AND!XOR managed to put out is spectacular. Hardware design, firmware, interactivity, and even execution of their marketing machine are all superb. They even shipped in branded boxes, did so with plenty of time before people need to take them on the road, and have followed up with user hacks as they happen. This is a business, but one done by a group of friends for the love of hardware art. 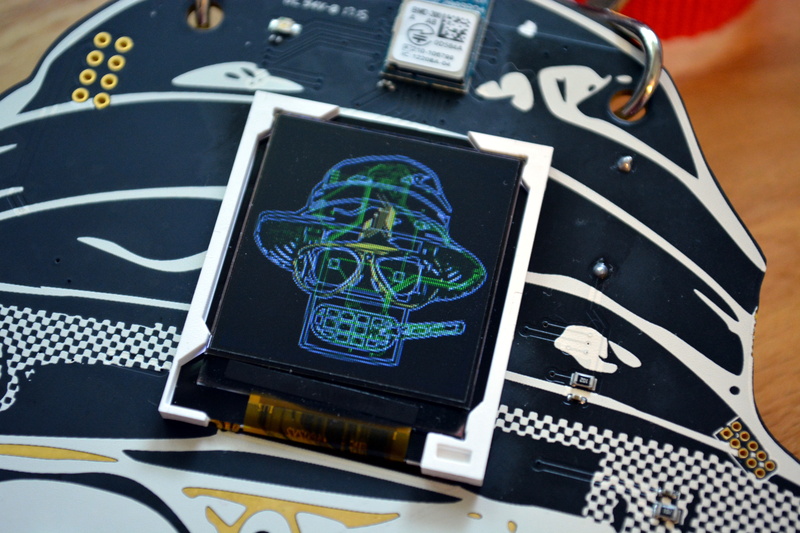 Some of the AND!XOR crew will be joining us on Friday to a Hack Chat about Badgelife: the movement behind all of the unofficial hardware badges we’ve been seeing this year and over the past few. Definitely a homage, kinda bummed they didn’t mention it in the article. No doubt about it, but just how the heck does this mash with Bender??? I’m curious – how much do these badges cost? As in: It looks cool, can I buy one or do I have to attend a conference on the other side of the world to get one? For some reason I assumed these badge things were done relatively cheaply as a sort of disposable trinket for attendees rather than an expensive souvenir. For $120 I have to admit I’m a little less impressed by the whole thing. Yes some can see the price point of $120 to be steep, I understand. There are also other indie badges that sell updwards of $300, not that it’s an excuse. It’s also a fully usable development board of which most of the software will be open source. Our goal is to make a hackable, educational, fun electronic badge (dev board) that is ready for use outside of the conference. It takes us the whole year to develop it and we have been given feedback that the price is not crazy high for what the hackers are getting. Yes, if you didn’t get one from supporting us on Klikstarver (the crowd sourcing site for starving children) we will be selling them in Vegas the same time during DC25. I dont know where you live, but unless its smack dab in the middle of the Indian Ocean (https://www.freemaptools.com/tunnel-to-other-side-of-the-earth.htm) you do NOT have to travel to the other side of the world. See you in two weeks in Vegas! Hi, Do you know where and when at DC25 these badges can be bought at? Also will you take card or will it be cash only? I’ll be at BSides and DC25, just want to make sure I can get one of these badges. We will be announcing the via our twitter account @andnxor, of when/where to get your hands on them. You will need to keep a close eye out on our feed to get a jump to finding us to buy one. We try to keep it random to have fun with it, but also not to favor any one or group so the opportunity of getting one is even. So we can’t promise one to anyone, but we can tell you how to increase your chances of getting one. twitter.